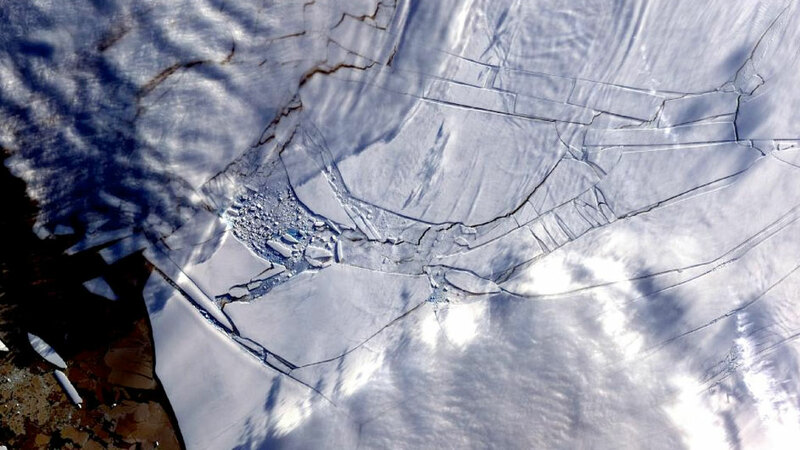 The collapse of the ice bridge between Charcot and Latady Islands on the Wilkins Ice Shelf on April 1st marked an important milestone in the drama of the gradual disappearance of the ice shelf on the Antarctic Peninsula. Break-up events have been occurring on the Wilkins since1993; however since a major break-up event in February 2008, only a 40km-long ice bridge between had been holding the ice shelf in place. Between half a kilometre and a few kilometres wide, the ice bridge finally snapped at its narrowest point, succumbing to the enormous stresses it had been subjected to for over a year. In light of this recent collapse, SciencePoles spoke again with Dr. Angelika Humbert from the Alfred Wengener Institute (AWI) and formerly of the Polar Geophysics Group at the University of Münster for some insight into the causes of this break-up and what might be in store for the ice shelf now that the ice bridge has snapped. Along with her colleague Dr. Matthias Braun from the Center for Remote Sensing at the University of Bonn, Dr. Humbert has been monitoring and modelling the Wilkins Ice Shelf for several years. Do you know what triggered the collapse of the ice bridge? I had a look at a couple of high-resolution satellite images covering this ice bridge taken by the German satellite Terra SAR-X over the last few months and I made a model of how this deformation worked, which showed that the ice bridge had been deforming under the stress it experienced from ice creep and from the ice mélange, which exerted stress from the eastern side of the ice shelf towards the ice bridge. All this created pre-conditions that led to the ice bridge snapping at its narrowest point on April 1st. What do you mean by ice creep? Ice creep is when ice masses are so thick and massive that they deform under their own weight. If you look at the images of the ice bridge, on one side there is nothing but ocean, and on the other side you see a 'messy' area with old icebergs stuck together along with sea ice. There are even icebergs still there from the break-up event the Wilkins experienced back in 1998. This is what we call ice mélange. What exactly does the collapse of the ice bridge mean for the future of the ice shelf? The ice bridge between Charcot and Latady Islands was stabilising thenorthern ice front of the Wilkins Ice Shelf. There are currently riftsalong the northern ice front, and many have been there for severalyears already. New rifts formed at the end of November due to theredistribution of the load along the northern ice front after thebreak-up events that took place in 2008. What will happen now that the ice bridge has collapsed entirely and the stabilising effect the ice bridge brought to the ice shelf is no longer there is that the load will again be re-distributed. Rifts have been opening, and there are even small icebergs forming in these rifts. Icebergs will continue to calve off in the coming days or weeks. After this a second load redistribution process might begin. I expect that new rifts will form more or less parallel to the northern ice front and thus parallel to the rifts you already see on the satellite images, and that there will be some calving there as well. In the best case scenario, the ice shelf will lose only 800 km2. In the worst case scenario it might lose up to 3,700 km2, leaving only about 8,000 km2 of ice shelf behind. This means a loss of about 30% of the current area of the ice shelf. That's quite a lot! And even the worst case scenario is optimistic: It predicts that a new, stable ice front would form between Latady Island, the Petrie Ice Rise, Dorsey Island and the grounding line of the ice shelf in the east, which would require the build-up of a kind of arch of compressed stress. We often only focus on images that show the northern part of the ice shelf, because this is where the ice bridge was. But in fact the Wilkins Ice Shelf has two large inlet areas and also a southern part, which is not often covered in the satellite images we're taking at the moment, because the southern part of the ice shelf looks stable at the moment. Would the southern part of the ice shelf be affected in your worst-case scenario? I don't think this area will be affected at all. However if this stable ice front I mentioned before does not form, then the southern part of the ice shelf could eventually be affected as well, and then far more that 3,700 km2 would be lost. A year ago you said that the Wilkins Ice Shelf may at some point shrink to an area of about 8,000 km2. Do you think that the ice shelf might eventually stabilise at 8,000 km2? Yes, this is possible. If a new northern ice front forms, this might be the new limit of the Wilkins Ice Shelf. However, we should keep in mind that what happened to the ice bridge between Charcot and Latady Islands might happen in the next few years between Latady Island and the southern grounding line (the boundary between the floating ice shelf and the grounded land ice that feeds it), which means this ice front could presumably retreat as well. How long do you think it will take for this current break-up event to play out? There's no good prececdent to compare this to. In June and July 2008, we saw a break-upevent that took a couple of weeks. I would say that this break-upevent will last as long as that. However I have to say that after last year's June-July break-up event, when a lot of mass was lost at the northern ice front, I saw rift development in the north-eastern part going on until the middle or end of September. A rift can form a few months or even half a year after load redistribution occurs. Where would you say the largest part of the load is at the moment? It's along the northern ice front. But you have to keep in mind the Wilkins Ice Shelf is sitting on a lot of small islands. It has a lot of small, grounded areas. The load around these small, grounded areas is difficult to estimate, and they play a major role, so I don't think it would be wise to make a statement as to the exact location of where the largest part of the load of the ice shelf is at the moment because I haven't modelled the entire ice shelf. This is something I would need to do before I could give you a more precise answer. With winter approaching in Antarctica, will this help slow the rate of collapse at all? No. Sea ice forms in winter, but sea is nothing more than a thin film on the ocean, and the ice shelf is about 250 m thick. Sea ice would not be able to buttress something that massive. The only thing the onset of winter might do is keep the icebergs in the vicinity of the ice shelf from travelling too far. But it won't help to stabilise the ice shelf at all. Does more sea ice and trapped icebergs mean an eventual increase the area of ice mélange? This is a good question. This might happen. We saw this happen last winter after the June-July break-up. Following the collapse of the ice bridge, the remnants of the ice bridge might become ice mélange, adding to the ice melange already there. But it takes time for ice méange to develop, so it's too early to tell whether it would create a new area of ice mélange. If the winter is long enough, more ice mélange could build up. If not, the icebergs will eventually just float away. Angelika Humbert is an ice resarcher at the Alfred Wengener Institute (AWI) in Bremerhaven, Germany. She is a glaciologist who has followed a number of important ice calving events in Antarctica, including the dramatic break-up of the Wilkins Ice Shelf.